Our basic beams are a simple and useful solution to a range of lifting applications. The basic beam can be used to balance sling loads, reduce headroom, protect delicate loads and properly align slings with clamps. VersatileThree lug holes on each end allow for both single and double leg slinging from both ends. In addition to the extensive range of standard basic beams. We can design and manufacture to your specific requirements, including a hot dipped galvanised finish. 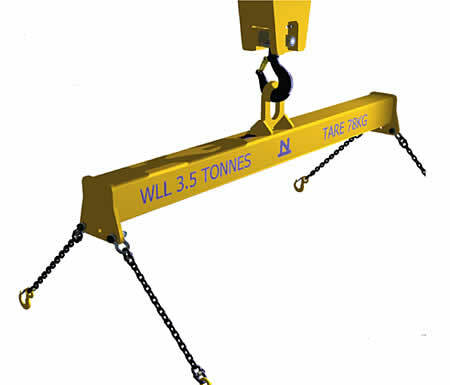 RuggedDesigned in accordance with AS 4991 for general purpose lifting with a design life of up to 20,000 cycles, with properly slotted and gusseted lugs. The basic lifting bars are individually proof tested and stamped in our accredited test facility.